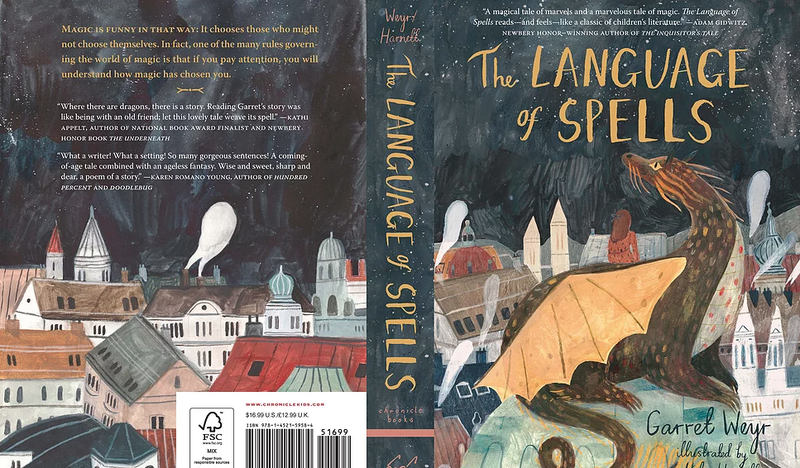 The Language of Spells is so many wonderful things, I don't even know where to start. 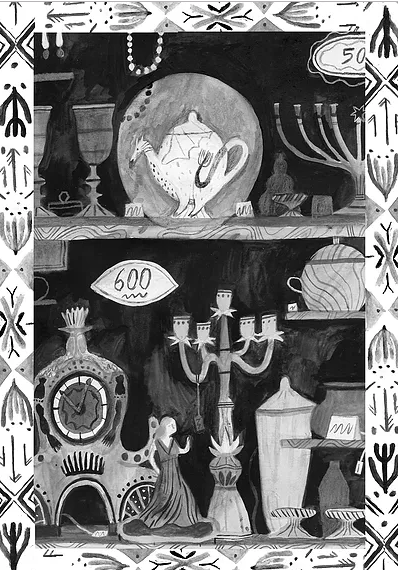 From the magnificent title to the superb illustrations to the gorgeous book design, I guess it's best to start with the one thing that makes all these others possible - Garret Weyr's unforgettable, masterfully written story. Or should I say Story. It has been so long since I read a book where the story curled up and sat with me, like a cat, inviting me to take my time making my way across the pages. 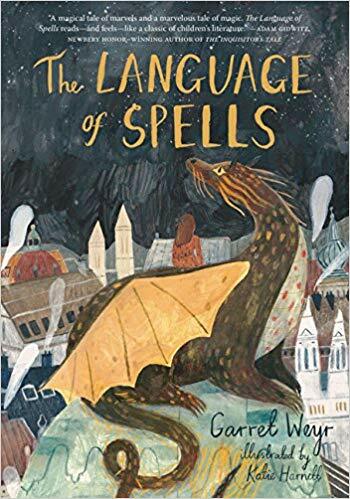 While The Language of Spells is very much a story of loss, it is also a story of memory and remembering and the many, sometimes magical, forms this can embody. The Language of Spells reads like a modern fairy tale, set in a specific time and place, but also, somehow, taking place over hundreds of years and in cities and forests all over the world. Born deep in the Black Forest in 1803, the arrival of Benevolentia Guadium to an extra twenty years, signaling the birth of a special dragon. 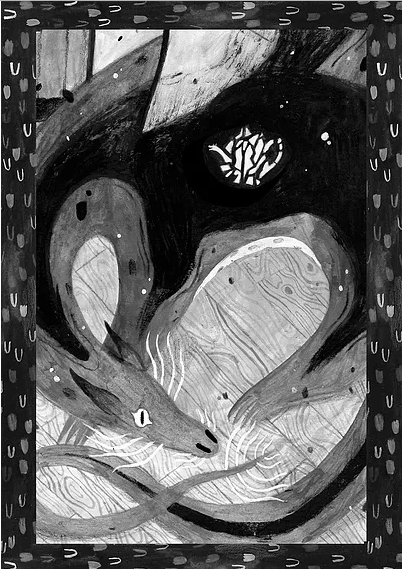 This dragon, known as Grisha, also happens to be the last dragon born into a world where human invention is beginning to eclipse the magic that was once visible to, "anyone who cared to pay attention." 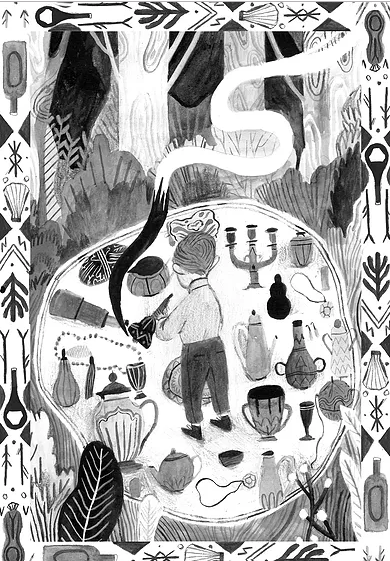 Captured by a sorcerer to Emperor Franz Joseph, Grisha is turned into a small teapot and carried everywhere by the emperor, often in his coat pocket. The death of the emperor does not bring release for Grisha, but it does bring about a new owner, a clever, generous man who dabbles in magic and eventually ends up in London, where he meets his wife and starts a family. While magic is no longer visible to everyone, there are those who seek it out and, if they make the sacrifices demanded by magic, it can be theirs. Sometimes life wasn't what you wanted, but it was still life. And Grisha, a creature of the forest, knew that being alive was what mattered most. He told himself he was happy and it wasn't wholly untrue. But neither was it wholly true. Eleven-year-old Anna Marguerite, or Maggie, enters the story after the end of WWII. The daughter of a poet father and painter mother, who died when she was three, Maggie's life is out of the ordinary, if solitary. 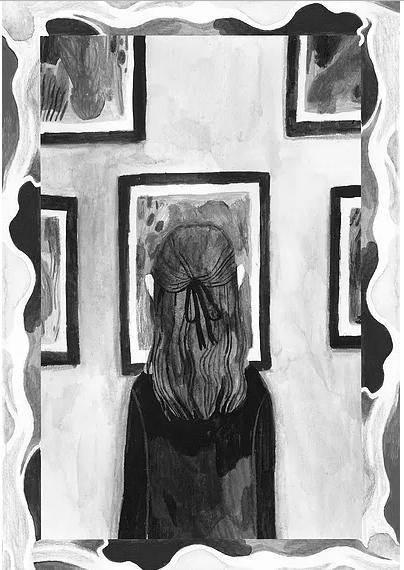 Raised in the Hotel Sacher and educated by her father, Maggie is a thoughtful, complete character, in possession of thoughts and observations every bit as fascinating as Grisha's. When a call for all dragons to report to Vienna (or be exiled to Siberia) brings about Grisha's release, he enters a community he has never been part of due to his decades under a spell, joining the dragons of Vienna who, while invisible to most humans, are also living under governmental restrictions that echo the totalitarian regime of Hitler. The unique experiences of these two individuals make for instant chemistry that results in a deep and powerful friendship. Their growing recognition that life is not right for the dragons makes for the suspense and action of the novel. The first 200 pages of The Language of Spells are devoted to these two unforgettable characters, their lives before meeting and the evolution of their friendship when they do finally meet at 2:00 am in the Blaue Bar in the lobby of the hotel, the one time and place the dragons are allowed to congregate. The friendship of Grisha and Maggie sends them on a path of investigation, uncovering buried memories, unravelling spells and revealing intentions that caused half the dragon population to disappear and the other half to become indentured servants with no hope of freedom. Gisha and Maggie hurtle towards an ending where, in a world where all magic demands a sacrifice, a heartbreaking and honorable sacrifice is made. "Fun," Maggie repeated slowly. No one had ever asked her that before. Fun and poetry were words like "delicious" and "espresso," she though. In theory, they could be one and the same, but it probably depended on the person. 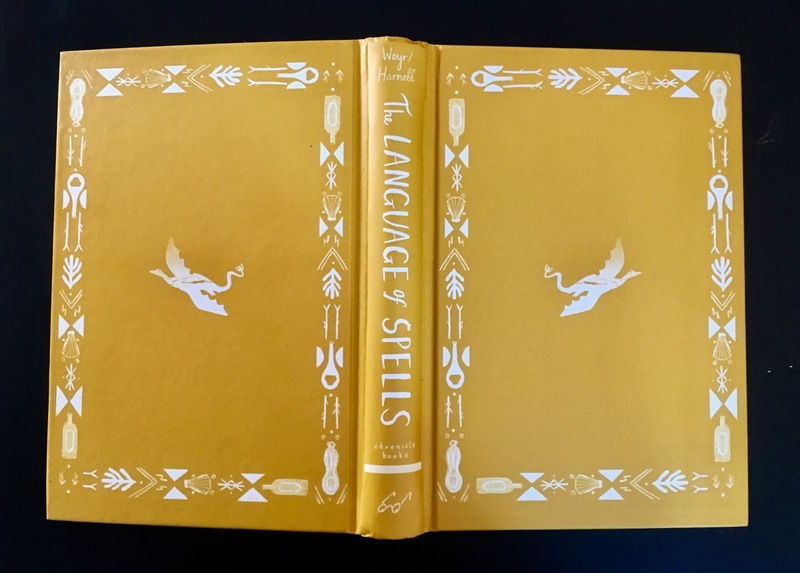 And, as I said at the start of this review, oh so long ago, The Language of Spells is an absolutely gorgeous book, from Hartnett's pitch perfect illustrations to the designs that frame them and also appear on the end papers. Always an extra special treat to me is when a peek under the dust jacket reveals a book case with designs, and this book delivers! 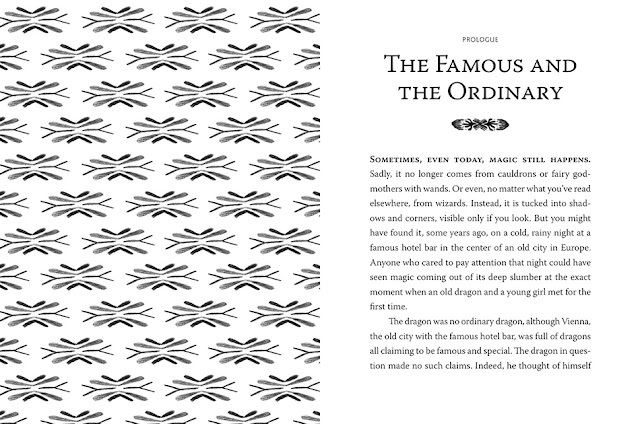 Finally, I have to also add that the thick, creamy pages of this book perfectly evoke the both the time period and the artisanal craft of making magic. This book makes the IDEAL gift for any young reader who is enamored of dragons or fantasy in general! This sounds like a not-to-be-missed read!